Bear with me on this one folks…a few things to hash out. Lots going on. First off, I’m loving the weekend media these days. If we are home on Sunday mornings I can’t take my eyes off the CBS Morning Show. Thankfully, (and surprisingly), this past weekend’s program included a feature all brown ink followers would appreciate. It’s a story of a man, David Rees, who sharpens pencils for a living. That’s his gig. And boy, does he have passion. It’s worth the 5 minutes and 44 seconds to watch him in action. And for the pencil junkie in your life, pick up one of his books, How To Sharpen Pencils, for a holiday gift. Perfect for those who still believe in a fine #2. Like Garrison says, it’s that time of year. And before December 1st kicks in this Saturday, take a look at these fantastic DIY advent calendars from oh happy day. I understand, there is only so much time in a day, only so much one can do. Try finding a moment to notice the beauty this time of year, put the lists aside and while you’re at it, grab that sharpened pencil and take Garrison’s advice. Write a letter while your mate bakes the bread. While sitting on a plane a couple weeks ago prior to taking off, I was speaking with my mother-in-law about company she was curious to learn more about. I told her what I knew, we said our goodbyes, and the plane took off. Typically on planes I pretty much keep to myself and prefer reading to chit-chatting with my neighbor. On the flight in question my neighbor didn’t notice the ‘Do Not Disturb’ sign and about twenty minutes into the flight he said “that’s a real nice flip phone you got there”. Ah well, nicely played, game on. Once the introductory formalities were dispensed with he whipped out his iPad and proceeded to spend probably thirty minutes showing me a super whiz-bang, multimedia presentation detailing the hearing aid he founded a couple years ago. Turns out my seat-mate was a 78 year-old retired ear surgeon, is a current professor at Stanford Medical School, and is a serial entrepreneur who’d founded and sold almost a dozen companies. He’d been in Minnesota because a large medical device company has its headquarters there and is an investor in his most-recent company. All that and he had more “i” stuff than a Cyclops and had the sense of humor to make fun of my old-time phone. We talked the entire flight about pretty much everything under the sun and hit it off. I liked this guy. When the flight ended and with a friendship established (or at least an airplane connection made), we exchanged business cards. 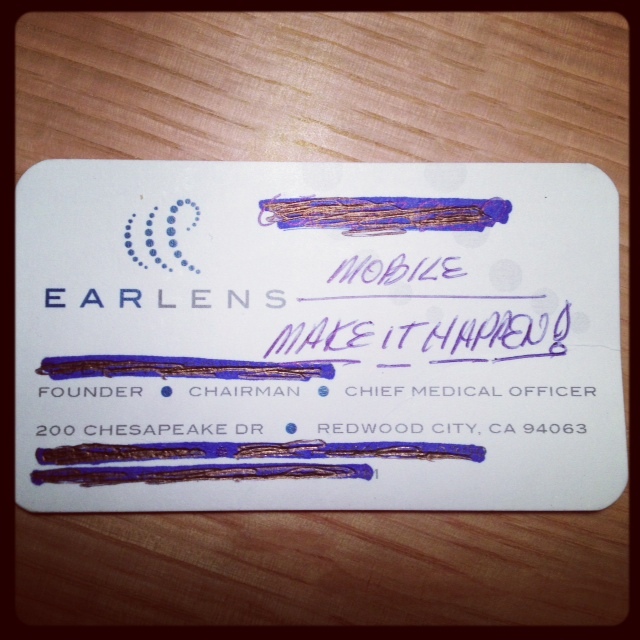 But before he gave me his card he took out a pen and wrote the words “Make it Happen” in all caps on the front of the card. He wasn’t going all Anthony Robbins or Gilad Janklowicz on me, rather, I think he was saying “It’s a great big world of opportunity out there and we all owe it to ourselves to do something about it”. None of this would have anything to do with the price of tea in China were it not for the fact that I had just hours earlier left a note under Wendy’s pillow which said something like “Thanks for everything you do, you make this family happen”. A cool coincidence. So what’s the point? I’m not exactly sure other than writing stuff down and creating a written record can have positive (usually at least) unintended coincidences and consequences. You can smell it in the air. A mix of excitement for people joining together, breathing in the seasonal air and letting out a big Ahhhhh while reminding one another all there is to appreciate in life. Last year I began the tradition of asking our guests to fill out a card with a thankful thought from the past year. As people reflected on the year, conversations brewed over all that had taken place and all that we hold dear to our hearts. Tomorrow they will have a chance to reflect again on what they have felt appreciative for over last year. If you have time to stop by Paper Source you can grab these cards or just make them up at home with colored paper. Daily Candy knocked off my idea (yeah right) with their own version, a gratitude jar, which again creates a time to reflect. That does not happen often enough these days. …these stitched place cards are pretty spectacular! Or even grab a bunch of lemons to use as place card holders and add a scripted Aunt Lucy to bring a burst of color to the table. Trivia on Thanksgiving? That’s a way to keep the converstaion going with Uncle Frank who would rather chat about his hunting adventures this fall. Our reliable Martha Stewart even created a template to download to make it easy to create even this evening. 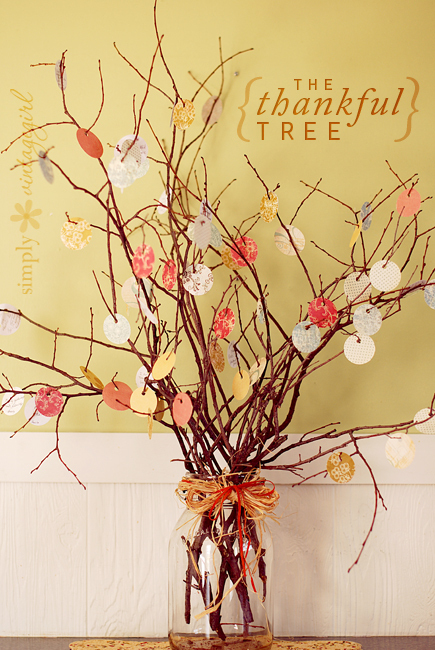 This Thankful Free can welcome the guests with autumn colors and a perfect way for one to express what they are grateful for in their lives. These I Am Thankful printables could be used for decorations, a napkin ring or another conversation piece on all there is to appreciate. But we must think about the kiddos, right? 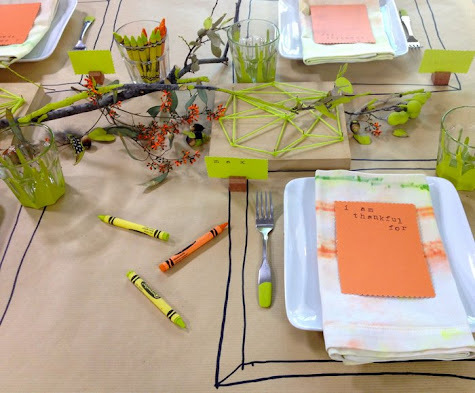 Simple Lovely created a great idea to keep the kids busy during the meal and also scribble out a a few thoughts of their own. Bring out the rainbow of colors for celebration like the folks at Design Sponge are all about. Over the top for some, perfect for others. Where ever you do find yourself tomorrow, we hope you find a few of those Ahhhhh moments when you squeeze that person beside you and remember that even in the midst of the unknown we truly do have so much about which to be grateful. Here’s something to kick off your Monday morning. A little Bob Dylan tune with a handwritten, personal touch from Leondro Senna who was looking to get back to basics. Yes it’s true. I just recently blogged about a service which turns your email into a letter. But if you did not jump at the chance then, no excuses now…this one is FREE. To give you a little background, Ivan Cash had quit his day job in advertising to find simplicity in his life and found it through writing letters. No joke. He created Snail Mail My Email with the dream of sending a handwritten letter to as many people as possible while creating excitement about the letter writing process. What a guy. One month later 234 volunteers collectively sent 10, 457 letters around the globe. How fantastic. Ivan is at it again, this time it runs for one week only ending on Sunday. The bonus is you can request one custom option to be included in your letter such as a doodle, coffee stain, lipstick kiss or anything else you can think of. And it’s just as simple as sending out an email and they do the rest. Hello? Don’t miss this chance to send a letter to that someone you’ve been meaning to connect with. They will definitely read it twice.